here the function to add the column to the table only if column does not exist. recently I had a chance to work around getting value from different table and merge into single table as part of the migration. the same can be written in function, to shun the half human interaction. the function find_max() would return the max id i.e currval of the sequence. PostgreSQL : No operator matches the given name and argument type(s). Issue :: DATE data type with pattern matching operator (LIKE) in version 8.3 later. Date data type with LIKE operator works fine for the prior to 8.3 version. query will display all the name of date_of_birth falls on 2007-01-19. > might need to add explicit type casts. to get the same query output you may use "date_trunc" function its works like normal "trunc" function. query will round with date and display all the name. Below SQL query will return all the referential integrity (Foreign Key ) constraint in a current database. This statement return all the foreign key constraint including duplicate foreign key constraint that's differ in constraint name for the same reference (Parent) table & column for the child table. refers the same reference table & column. 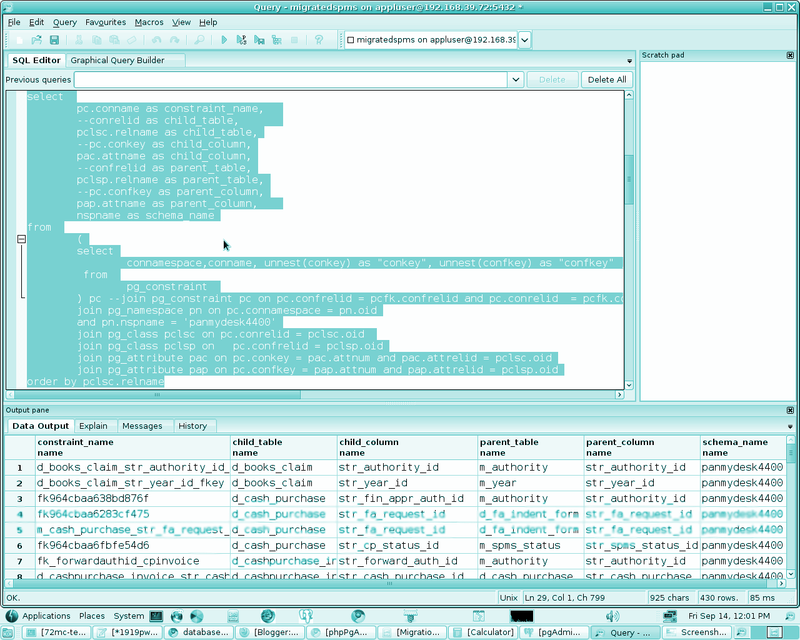 Here the plpgsql utility to compare schema to find the difference and generate DDL statement. 2) Generate the DDL statement for schema synchronization. Hadoop : Bad connection to FS. command aborted. localhost/127.0.0.1:54310. Already tried 0 time(s). localhost/127.0.0.1:54310. Already tried 1 time(s). Bad connection to FS. command aborted. after I removed the property from the hdfs-site.xml, it is working fine. 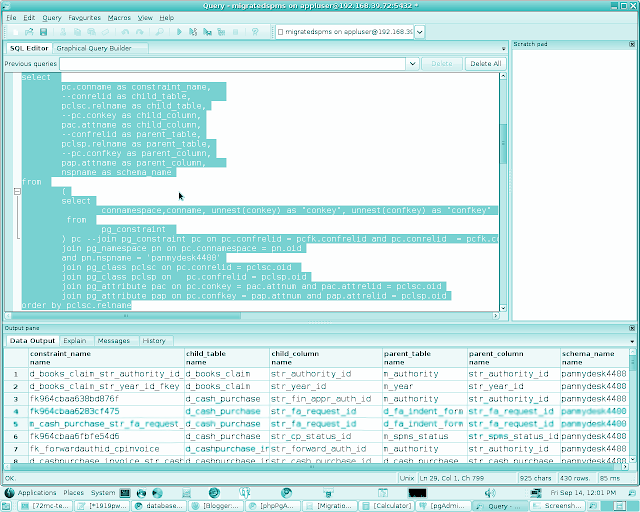 List the Table / Object size in Postgresql Database. Above query will result the TOP 10 Object, If you would like to view all the table just remove LIMIT keyword from the query. If you have column that replicated in 500+ tables then to some extent you really do have to execute 800 update statements. But you do not have to type out all 500+ update statements -- it is better to have a function that help you to create the targeted update statements. Here the plpgsql utility to compare tables and find the difference between given schema of the database in PostgreSQL, And it returns differences table name as well as DDL statement for schema synchronization. Function accept two schema of same database and it return statement that contains, table differences in schema, and automatically generated Data Definition Language (DDL) scripts ( for synchronization ) that you can use to update the schema of the destination to match the schema of the source. here both schema should be in same database, mostly it used in multi-tenant (single database with multiple schema ) architecture. By using this function we can able to know what all are the new feature added in one then other schema. Here the simple function will move the table from multiple schema into single schema. This function actually move table from existing schema into new schema, i.e you would not find table inside existing schema once this function is called. All the table will be moved into new schema with structure including all constraints and the values. Here tenant1 is the name of schema to which all the table will move. If schema does not exist the function will through error like " ERROR: schema "tenant" does not exist"
2) Database test restored with 9 different schema. Schema tenant1 created with empty tables. 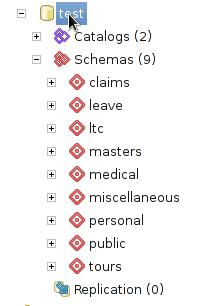 Existing schema master having 56 tables. All the tables from 9 schema are moved into tenant1 schema, tenat1 schema having 134 tables.